Liberals venerate security and intelligence figures like Michael Hayden and James Clapper for opposing Donald Trump. But these "resisters" are just as bad as Trump on a free press and government transparency. Part of why the liberal and centrist response to Donald Trump has been so maddening is that, in their haste to embrace anyone opposed to the president, they elevate figures who espouse equally alarming political visions, from Bill Kristol to Glenn Beck. An episode yesterday demonstrates the absurdity of this situation. On Sunday, Donald Trump made yet another hostile statement about the press, tweeting that when the media “reveals internal deliberations of our government, it truly puts the lives of many, not just journalists, at risk! Very unpatriotic!” Trump went on to complain in subsequent tweets about the media’s supposedly unfair treatment of him, a rant seemingly triggered by New York Times publisher A.G. Sulzberger’s strong words to Trump in a private meeting. The outburst sent the media and Twitterverse into the piques of outrage that typically follow the latest unhinged tweet from the White House. Cenk Uygur (who criticized Obama on similar grounds) called him a fascist and said the tweet represented “the first step in imprisoning journalists” and to “destroy the free press”; others compared him to former Ugandan dictator Idi Amin. Various outlets placed it in the long context of Trump’s anti-media rhetoric, with the Washington Post pairing its story with a video comparing Trump to dictators. Trump’s verbal attacks on the free press should be condemned harshly. They are exactly the kinds of things an incipient authoritarian would say to gear his followers and the wider public up for a crackdown on the press. The problem is, Trump, as usual, was simply parroting the kind of language he’s picked up from those now lionized as his opposition. It’s hard to see the distinction between Trump’s words yesterday and those of these three intelligence officials. In these and other public statements, the three warned that unauthorized disclosures that were published by the press about the intimate behind-the-scenes working of the US government were damaging to national security, would get Americans killed, and were potentially unpatriotic. 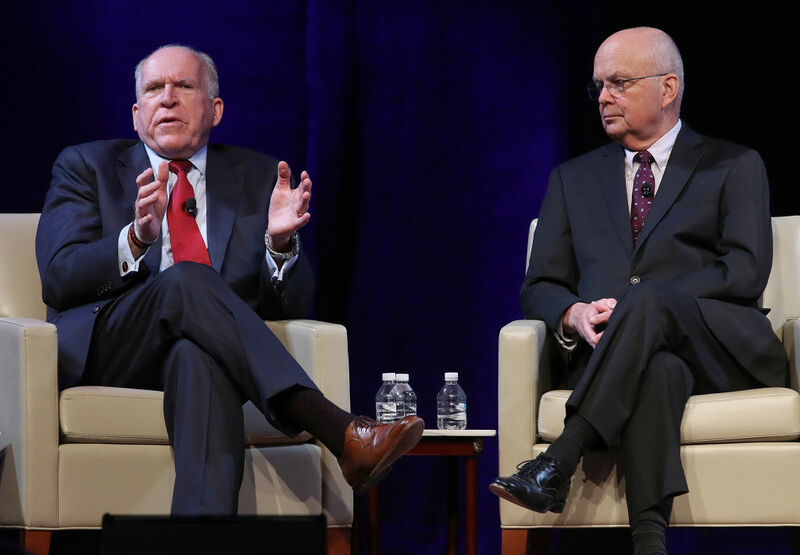 It might be argued that Hayden, Clapper, and Brennan were talking specifically about national security. But Trump mentioned the “internal deliberations of our government,” a rubric that involves national security information that’s potentially even more sensitive than what Snowden leaked. One might also argue that Hayden and Clapper were referring specifically to a leak instead of reporting. But this is moot, given that Snowden’s disclosures were only fed to the public through the medium of newspaper reporting. Note, too, that Hayden and Clapper’s arguments were just as baseless as Trump’s, with plenty of evidence showing NSA spying is far from a vital tool. Functionally, there’s little difference between the most recent statement that has led people to call Trump a fascist and the kind of rhetoric casually deployed by members of the D.C. national security establishment. What does it mean that the men now venerated by the media and wider political culture as Trump’s fiercest opponents share essentially his same views on the limits of the free press and transparency, views that have led Trump to be labelled a dangerous strongman? For one, it’s a stark reminder of why many on the Left have spent years warning liberals and centrists not to rehabilitate Washington’s warmongers and snoops simply because they occasionally give some off-hand criticism of Trump. But it’s also a reminder of the incoherence of the current opposition to Trump. Anti-Trumpism surely has to mean more than just objecting to Trump the figure based on his personal qualities. Shouldn’t it also involve resisting all those who share the repugnant policies and values of his agenda? Trump’s authoritarian views on cracking down on the press are shared by a broad swath of the political establishment. Until members of the #Resistance realize that, it’s fair to ask them what exactly it is that they’re resisting.